Recent studies have revealed that children are getting acne in much younger age and doctors are providing new guidelines to treat children's acne. Natural remedies for acne are recommended for all, including children because the most remarkable thing about natural remedies is that they are completely free from side effects. However, the conditions differ from one child to another. You can also use natural remedies immediately when there is breakout of acne on your child's face. This will help clear your child's skin quickly and perhaps you can prevent it from occurring also. The main problem that doctors and parents face is that the skin of children is different from adults and they have not even gone through the changes of puberty. Also, it is difficult to find out how much of acne that has occurred is due to bacteria and not due to change in hormones. Baby acne is a skin problem usually seen in children from birth to 7 months old. This is caused because of exposure in the womb to maternal hormones. Usually, doctors recommend taking some precautions and do not prescribe any medicine or treatment. It goes away with time. If there are some associated symptoms like fever, rashes, poor appetite and others, you should consult the pediatrician. Have a quick look at some beauty tips for dealing with children's acne. Keep the child's face clean. Wash her face gently at least twice a day. Use only soaps recommended for infants. Sometimes soaps create or exaggerate the problem. So, observe and discontinue using soap to see if it gets better. Keep the skin of your child dry. It is recommended to simply pat dry the face. Be certain that you wipe off your child's face whenever she spits or she is fed because if moisture remains for a long time, it will only worsen the condition. Make sure your child does not squeeze or touching pimples because this might create further problem and will leave scars behind as well. In case of baby acne you have to be more careful and prevent your child from scratching her face. Avoid oil based creams to apply on your child's face. Unless your child has extremely dry skin, use a moisturizing baby wash till acne gets cleared. Try using baby powder. Many have found that gently applying baby powder in the affected areas have helped them get rid of the skin problem in their infant. Take care when applying the powder and see to it that it does not enter the child's eyes, nose or mouth. If you are breastfeeding, change your diet. Some mothers have felt that since they took sweet or citrus fruits, their infants had skin problems. You can try changing your diet and take the advice of your doctor regarding that. Talk to your doctor about the acne on your infant's face. He will find out whether it is a reaction to any medicine given to her or not. Your doctor will prescribe an alternative medicine so that it does not cause a skin problem. If acne does not disappear in few weeks or months, you can ask your doctor to prescribe a stronger medicine to treat acne on your child's face. However, it is advisable to stay patient because it usually clears off in 3 to 7 months of time. 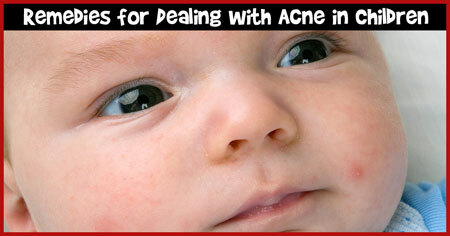 Although, baby acne may seem bothersome to you, it most probably does not bother your child. Just be cautious and watch out any pimple or rashes in any other part of your infant's body. Baby acne is confined to the face of the infant. Therefore, if you find anything that looks like acne on any other part of your infant's body, consult your doctor. Why do young children get acne? How to treat acne in small children? What to do in case of persistent acne in small children? Discuss here. Comments: It is necessary to keep the skin of the babies clean. Comments: Diet is very important. Faulty diet can result in acne. Comments: It is necessary to use right kind of baby products to keep acne away for babies.